Recalling the Easter floods of two decades ago will be a poignant experience for many across our county. Homes were ruined and lives lost when a whole month’s worth of rain fell in a single day. The area of Northampton I lived in at the time escaped unscathed – but reporting on a full-blown disaster just a couple of miles down the road was an unsettling and surreal experience. Thankfully, some of its impacts were altogether less heartrendingly tragic. I have open on my desk Northamptonshire CCC’s yearbook for the 1998 season, as well as the relevant edition of Wisden. Look carefully at the squad photo in both and you’ll notice it was actually taken in the car park at the back of the old indoor school at Wantage Road, now the Ken Turner Stand. Our gallant chaps are sitting and standing on the white lines to indicate the parking spaces – and everyone’s looking a tad uncomfortable. The explanation is simple enough. The outfield at the County Ground, where the pre-season snaps are usually taken, was so wet a conventional photo-call simply couldn’t happen. It was still raining, and the car park had to do. Local residents were thus dazzled by surely the most garish set of tracksuits in the club’s history – predominantly daffodil yellow with a band of traditional maroon around the midriff. I say the players and support staff looked uncomfortable on account of the miserable weather. Had they known what the season itself held in store, their expressions might have been less cheery still. Northamptonshire went into the campaign with a new captain, the late and much-missed Kevin Curran replacing Rob Bailey, while John Emburey was in his third year as director of cricket. The first glitch saw Australian seamer Paul Reiffel – now a Test umpire – forced to pull out of his contract as the County’s overseas player, with West Indies international Franklyn Rose signed as a replacement. Some less charitable Northamptonshire supporters were occasionally heard warbling a variant on the old Nat King Cole hit – ‘Franklyn Rose, Franklyn Rose, why he came here, no-one knows…’ – but to be fair he snapped up 50 Championship wickets, only Paul Taylor taking more. If we think spring has been late springing this year, conditions were equally miserable in 1998. Snow flurries interrupted the opening friendly at Fenner’s, and I remember making a wasted journey to Southampton where the first day’s play against Hampshire at the old Northlands Road ground was washed out. 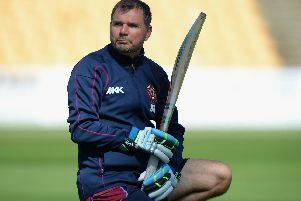 In between those two matches, Curran’s men spent a lot of time twiddling their thumbs at The Oval – although this rain-ruined fixture saw the Championship debut of 19-year-old Graeme Swann. Surrey’s Ali Brown got after him a bit in the cricket that was possible, but the younger cygnet gained a hefty measure of revenge on batsmen around the world over the next 15 years or so. Fast-forward a month to the home match against Glamorgan at Northampton. When David Ripley toddled out to join Mal Loye on the third afternoon, Northamptonshire were 142 for four in their second innings – still needing another 249 to avoid an innings defeat. Would it last the day? Well, yes, it would. The pair were still together 92 overs later, having added a record-breaking 401 for the sixth wicket, and there was still time remaining for Mal to make more history by eclipsing Raman Subba Row’s 300 as the County’s all-time highest individual score. A lot of people will tell you they were there. But they must have been hiding under an extremely large table. Only a few hundred punters were in the ground, in contrast to the 40,000 Cobblers fans who journeyed to Wembley that day to see their side lose to Grimsby in the Division Two play-off final. Did we feel smug? You bet we did. When the season’s high-water mark comes at the back end of May you don’t need to be Poirot or Endeavour to twig that it isn’t going to figure among the club’s vintage summers. In the space of a couple of weeks the team was dumped out of the NatWest Trophy in the first round, surrendered to Worcestershire inside two days – denying the Supporters’ Club their planned jaunt to New Road – and saw Leicestershire knock off 204 in 19.1 overs to win (in the Championship, note!) at Grace Road. Like my car after going over a pothole in recent weeks, the wheels definitely sounded as though they were working loose. saw Jason Brown picked as the only spinner on a pitch that turned sharply by the end. Then, desperate for a win, the team management decided to play Sussex on a Wantage Road strip marked ‘poor’ for a Sunday League game ten days earlier and barely renovated. It was all over with four full sessions to spare – Brown, Swann and Michael ‘Dickie’ Davies sharing 17 of the 20 wickets to earn victory by 136 runs. But we all knew what was coming, and come it duly did as ECB docked 25 points for the state of the track. The dirt-track. Within a month Emburey had departed Northamptonshire with a year of his contract left – not before presiding over a retained list that saw Richard Montgomerie deemed surplus to requirements, a crass decision that still rankles with your correspondent today – and Curran lost the captaincy after a single season. It wasn’t all gloom, though. The Second XI had a fantastic year under coach Nick Cook and regular skipper Jeremy Snape, doing the double of Championship and one-day titles.